One of the many things I love about spring is that you can start to wear brighter, cheerier colors and short-sleeved shirts, if the weather permits. And one of my favorite spring and summer items is a t-shirt. They are basic, but classic. Depending on the cut, color and how you wear them, they can be quite trendy as well. T-shirts are a great part of any guy's wardrobe. They're comfortable to wear and allow us to express our moods, interests and unique personalities. If you're looking for cool t-shirts to add to your wardrobe or want something unique for an upcoming event, shop from our awesome collection of t-shirts. No matter what type of t-shirt you need, we are sure to have what you've been searching for! 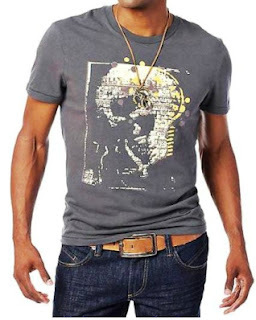 Shop Online at www.indiaplaza.com & you'll find a fantastic selection of t-shirts for men of brands like Basics, Locomotive, Probase & Clifton at low prices so you can afford the look you want. I absolutely love this t-shirt. It's such a fun way to make your own t-shirt to remember the summer by! I'm going to have to try this one out!Yes every wants to change his t-shirt with season starting.